There is a non refundable Deposit of a £100 and Balance payable 4 weeks before holiday dates. There is also a bond of a £50 for breakages or damage which after inspection will be refunded within 1 week. Our 2016 caravan is in the Guillemot area which is an excellent location on the beach side of Kiln Park. It is close to all the amenities and beach path. Deluxe & spacious caravan with 3 bedrooms. Double bedroom includes en-suite toilet and hand basin. Separate WC and shower room. Fresh, clean, light & airy. New duvets and pillows. 32" HD-LED TV/DVD. Kitchen equipment (incl. 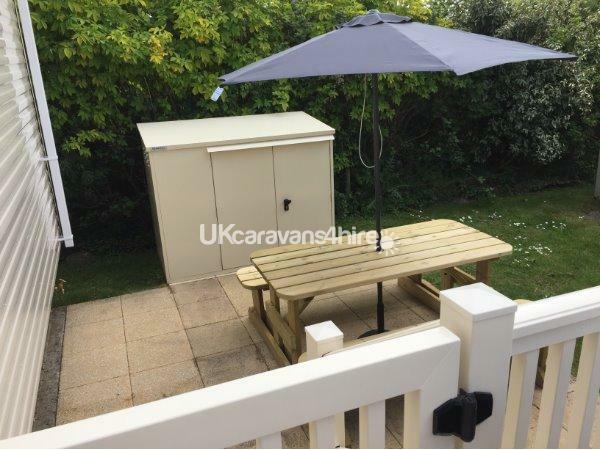 plastic plates & cups for kids), Table and chairs on decking. Picnic bench on patio area. Child-friendly. Board games & DVD's. It is ideal for families (max 6). Master bedroom, and larger twin bedroom both have 19" TV/DVD. Please Note - Pillows, Duvets, Pillow and Mattress protectors are provided for three bedrooms, but you will need to provide your own bed linen, and towels. It is under a 10 minute walk to the beach, and golf course. The outdoor pool & playground are a 2 min walk, The entertainment centre and indoor pool is also close by. Tenby town is a 15 min walk. The site facilities are excellent with indoor and outdoor pools, new restaurant and bar, kids clubs for all ages. The beach is lovely and accessible, and Tenby Town has plenty to offer in the way of cafes, and restaurants, and also some beautiful views over the harbour. There are numerous attractions close to Tenby such as Folly Farm, Manor Park Farm, and Oakwood Park. You can buy entertainment-complex passes from Haven in advance. Takeaway, Grocery Shop, and Laundrette (tokens available from site shop).